Here is my one layer card for FTL102. 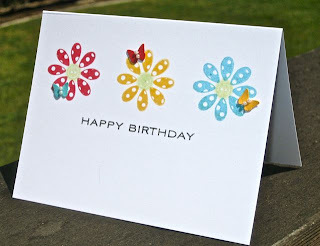 I love these polka dot flowers with the teeny butterfly. Great job Harriet. Terrificly cute flowers. Love the tiny butterlies. Super cute card! Love those flowers, and the teeny butterflies! Oooh.........THUD!!! HARRIET!!! I love this thing!! !